Arlington, Va. - April 16, 2012 - PBS Distribution today announced it is releasing American Experience: Grand Coulee Dam on DVD. During the darkest days of the Depression when construction was started on Grand Coulee Dam, everything about it was described in superlatives. It would be the "Biggest Thing on Earth," the salvation of the common man, a dam and irrigation project that would make the desert bloom, a source of cheap power that would boost an entire region of the country. Of the many public works projects of the New Deal, Grand Coulee Dam loomed largest in America's imagination, promising to fulfill President Franklin Roosevelt's vision for a "planned promised land" where hard-working farm families would finally be free from the drought and dislocation caused by the elements. Not surprisingly, the reality of Grand Coulee could never live up to its mythic image. Featuring interviews with the men who worked on the dam and families who lived alongside it, Native people whose lives were profoundly altered by it, and historians and writers who have sought to grapple with its many contradictions, "GRAND COULEE DAM" explores the astonishing achievements and profound controversies that are part of the dam's legacy. At once a symbol of America's remarkable ability to dominate nature and rejuvenate an entire region of the country, it is also a cautionary tale about arrogance, our relationship to the natural world, and the price of progress. 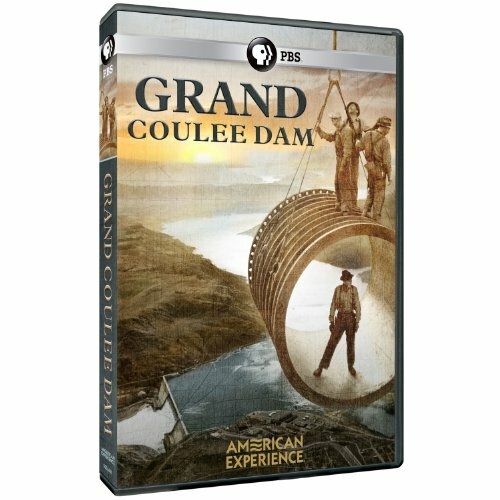 American Experience: Grand Coulee Dam will be available on DVD May 15, 2012. The running time of the program is 90 minutes. The SRP for the DVD is $24.99. The idea for Grand Coulee Dam was born in 1918 in the dusty little town of Ephrata, Washington. Rufus Woods, editor and publisher of the Wenatchee Daily World, and other local boosters had hatched a plan for what then seemed like an impossible dream - a dam on the Columbia River next to a huge ditch carved out by floods thousands of years before, known as the Grand Coulee. At this one spot, the Columbia could be captured in a massive reservoir. The water could then be pumped up over the river's canyon and into the Grand Coulee, that would become a new reservoir. From there, the water could be fed southward by gravity and irrigate more than a million acres of good farmland. It was a remarkable vision, but because of its size and its cost, the project remained an elusive goal. While Grand Coulee Dam was touted as a visionary project that would transform an entire region of the country, to realize its Olympian goals, the dam's vast reservoir would destroy Native American communities, inundate sacred fishing spots and ancestral burial ground, and erect an impenetrable barrier denying salmon access to their spawning grounds. The builder of the dam was the Bureau of Reclamation, the vast federal agency in charge of water projects in the West. The Bureau intended to relocate the communities affected by the dam and use fish ladders and hatcheries to try and protect the salmon population, but its plans proved ineffective, and some promises went unfulfilled. During the dark days of 1933, there was little consideration of the extraordinary changes that the Grand Coulee would have on America's wildest stream - on its rapids and waterfalls, its fish and the native peoples whose world revolved around it. Rufus Woods and FDR's engineers and builders believed that they could achieve miracles with the Columbia. And they were ready to begin. By the end of 1940, Grand Coulee Dam was nearing completion, but FDR and his New Deal were on the defensive. The President's attempts at balancing the federal budget during his second term had pushed the nation back into recession and unemployment had once again soared as high as 19 percent. To date, the dam had dislocated the Indians of the Colville Reservation, devastated the Columbia's salmon, and 72 men had lost their lives on the project. It looked as though the critics of the dam had been right all along. Then just as the dam was nearing completion, the Japanese attacked Pearl Harbor and America was at war. Power from the dam helped make the aluminum used by the Boeing Airplane Company in Seattle which churned out a third of the planes used in the war effort, while in Portland, Grand Coulee's power brought 750 big ships to the high seas. In addition to these more conventional war industries, a large share of the dam's electricity also went to one of the Manhattan Project's more secret locations, an isolated spot on the Columbia called Hanford that produced plutonium for the atomic bomb that was dropped on Nagasaki, Japan, bringing the war to an end. Over the course of the war, Seattle and Portland's populations boomed and a regional economy that had once been dominated by fishing and timber now boasted an industrial base to rival other major American cities. The Saturday Evening Post proclaimed "the white elephant comes into its own," and the dam was now seen as "one of the best investments Uncle Sam has ever made." Written and directed by Stephen Ives ("Seabiscuit," "The West," "Panama Canal"), "GRAND COULEE DAM" will premiere on the PBS series AMERICAN EXPERIENCE on Tuesday, April 3, 2012. Exclusive corporate funding for AMERICAN EXPERIENCE is provided by Liberty Mutual Insurance. Major funding is provided by the Alfred P. Sloan Foundation. Additional Funding for Grand Coulee Dam is provided by The Kendeda Fund, the Corporation for Public Broadcasting, and public television viewers. AMERICAN EXPERIENCE is produced for PBS by WGBH Boston. PBS Distribution is the leading media distributor for the public television community, both domestically and internationally. Jointly owned by PBS (Arlington, VA) and WGBH (Boston, MA), PBS Distribution extends the reach of public television programs beyond broadcast while generating revenue for the public television system and our production partners. PBS Distribution offers a diverse range of programming to our customers, including Ken Burns's films (Prohibition, The National Parks, The War, Baseball, Jazz), documentaries from award-winning series NOVA (The Elegant Universe, Origins), FRONTLINE (God in America, Bush's War, Growing Up Online), and American Experience (Freedom Riders, We Shall Remain), dramas from Masterpiece (Downton Abbey, Jane Eyre, Inspector Lewis), films from independent producers (Easy Yoga for Arthritis, The Buddha, The Story of India, Carrier, Journey into Buddhism, I.O.U.S.A. ), and popular children's programming from Dinosaur Train, Super Why!, WordGirl, Cyberchase, Martha Speaks, and Arthur. As a multi-channel distributor, PBS Distribution pursues wholesale/retail sales, consumer and educational sales through PBS- branded catalogs and online shops, and international broadcast and video sales. PBS distribution is also a leader in offering programming through digital platforms including the internet, mobile, and web-connected television.